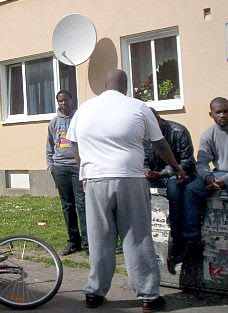 The Swedish city of Malmo to some extent allows once to take a prescient glance into the future of Europe as immigration and demography make it Islamic. 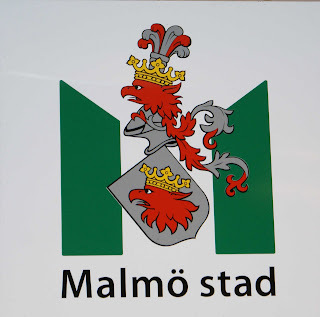 Malmo may not yet be an Islamic city but it is well on its way to being awarded with that status. It was for this reason delegates at the International Civil Liberties Alliance Counter Jihad Conference were invited to take part in a fact finding tour of the city to see what other European cities had in store for them if our political establishment is allowed to continue to sell us down the Islamic river. For safety’s sake the trip took place in daylight, rather than at night when mobs roam the streets in violent rage. Scorch marks were visible on rubbish bins and the police maintained a constant vigil even when we were there during the daytime. In fact we interviewed some of the police who had the misfortune of being assigned to this area. The video of this interview should be online shortly and is well worth watching. 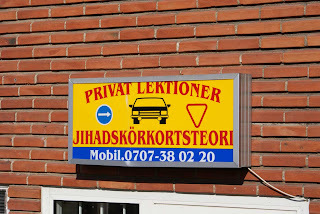 We paid a visit to the famous Jihad Driving School, a must for any counter jihad tourist wanting to see the future of European driving instruction. There were funny looks from locals as we crossed such sites off in our guide books. Residents of Herrgården seemed to be marking their territory as Dar Al Islam by using Arabic style lettering, how long will it be before actual Arabic is used in such areas and on street signs? I wonder if such concessions for Arabic culture are paid for out of the public purse. When does the anti Western madness stop, how much more ‘enrichment’ can western society cope with before it ceases to exist in a coherent form? There is evidence of apartheid like segregation which shows that multiculturalism, when allowed to run to its logical conclusion creates a divided and inharmonious society. We visited a shopping centre that was effectively divided into Islamic and Swedish sections, with the former having the feel of a shopping area of a Middle Eastern city. Our presence resulted in many strange looks from shoppers, so out of place we looked in our Western clothes. It might have been my imagination but you almost feel the tension rising the longer we stayed. Eventually in the interests of cultural respect and interfaith harmony we retreated back to the Swedish enclosure, though even there was evidence of Islamisation – perhaps in the future Swedes will end up shopping in a completely different location altogether. 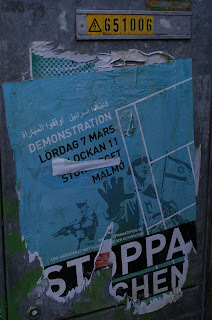 The political posters advertising demonstrations show the true mindset of Malmo these days. The one below is particularly instructive. In addition to the Arabic language is depicts Israel as a fascist state in order to try to delegitimize it. Such attacks on the only Western democracy in the Middle East illustrate quite clearly the Islamisation of Malmo. Perhaps the Swedish state will soon be grouped with Israel if it does not surrender to Islamist demands with the required degree of alacrity. 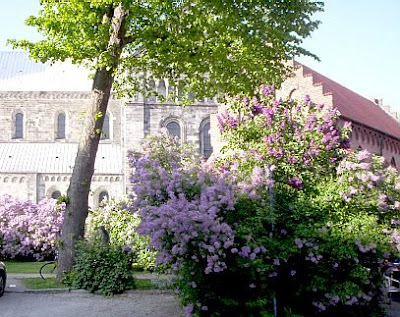 Our final stop was at the Grand Mosque of Malmo which is located a safe distance outside the inner city trouble spots in a much more tranquil setting. I have so much material on my trip to Scandinavia that it will have to be broken up into several reports. 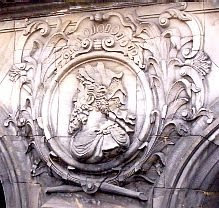 The lengthy descriptive accounts will come later; tonight’s post will feature a travelogue with selected photos. I arrived in Denmark a couple of days early. It gave me a chance to overcome my jet lag, and I took the opportunity to see the sights of Copenhagen. I’ll only use a few photos here; the rest will have to wait for another time. Acting like a tourist for a change, I took a sightseeing boat tour of the harbor and the canals. 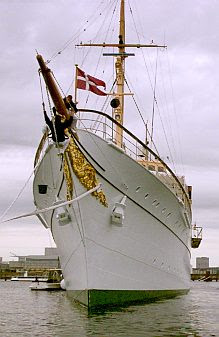 One of the more memorable sights was the royal yacht, which was being outfitted for the summer season. Queen Margrethe and her family use it to stay in contact with their subjects by visiting various ports and islands around the kingdom. 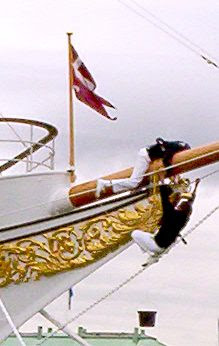 A pair of workman were cleaning, repairing, or painting the bow of the ship. One of them was straddling the bowsprit from above, and the other was clinging to it from below, supported only by a rope below him. It was not a warm day, and I wouldn’t have had his job for anything. On Friday, some of the meeting’s participants arrived early and took the train to Malmö to see what all the fuss was about. With the help of our Swedish contacts, we embarked on a safari that included the most important sights of the city. Ms. Sahlin is well-known to regular Gates of Vienna readers as a hijab-wearing Certified F**ker, not to mention one of Sweden’s most ardent spokescreatures for Multiculturalism. 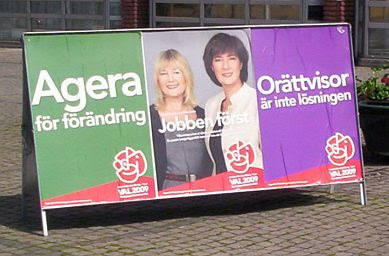 She is also a leader of the Social Democrats, and may become the next prime minister of Sweden if the SocDems regain power next year. 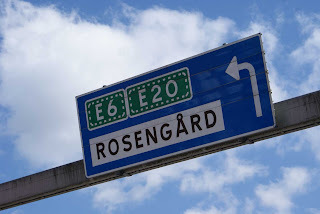 We passed through some normal-looking suburban areas before taking the turn for Rosengård. 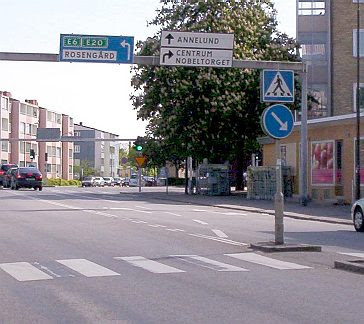 Rosengård is a large district with a number of neighborhoods and housing projects, some of which are notorious for their riotous and incendiary “youths”. Youths were much in evidence, but since we toured the area during the daytime, they were restrained in their behavior. Life in Rosengård is relatively sedate until the sun goes down and the night is illuminated by the golden glow of gently burning tires and dumpsters. 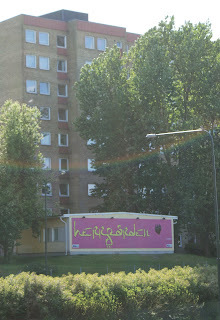 Among the other famous sights of Rosengård are the “suicide balconies” of the apartment buildings. Festooned with satellite dishes, they are the scenes of recurrent tragedies: from the balcony railings young girls frequently and mysteriously fall or hurl themselves, often to their deaths. Adjacent to the Rosengård Centrum parking lot is a take-away restaurant, specializing in falafel, pizza, kebab, and other traditional Swedish delicacies. Rosengård Centrum itself is a very culturally-enriched commercial establishment, but it is not uniform in its enrichment. 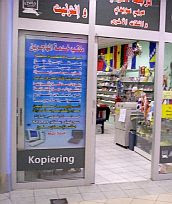 The northern section (“City Gross”) is a large store in which “persons of Swedish background” work and shop in addition to a modest number of Muslims. But the southern half (“Lidl”) is almost totally halal, a souk transplanted to Skåne from North Africa or the Arabian Peninsula. Inside the southern entrance the discriminating shopper will find a selection of Arab shops, restaurants, and other businesses. A clothing store makes an offer to bargain-hungry customers: “Buy a Hijab and Get a Free Present”. The advertising signs on the window of one establishment are entirely in Arabic. The signs outside a hairdressing salon are also in Arabic. 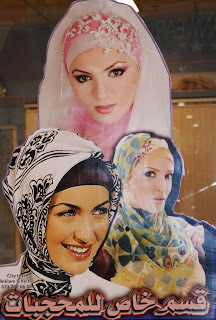 Notice that the smartly-coiffed models in the pictures on the window show only women in hijab, with the advertised hairstyles covered up by veils. How can a discerning customer be certain of what hair-do she will get? Just beyond Rosengård Centrum is the Herrgården housing estate, which consists of several high-rise buildings and a number of garden apartments along Ramels Väg. Visitors to Herrgården are greeted by a sign with the name of the estate presented in mock-Arabic script. Herrgården is the site of the infamous nightly arson attacks, in which “youths” set fire to dumpsters, tires, and the occasional rental trailer from the nearby Shell station. We drove up and parked by the Shell station, which stands at the junction of Ramels Väg and the main road. A large police presence was there, with several parked police cars and a number of officers just standing around their vehicles — presumably waiting for sundown and the nightly inferno. In the middle of the street are scars from the tire fires. 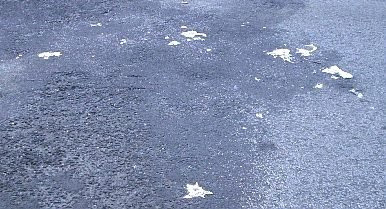 We could see puddles of melted metal (possibly aluminum from the trailers) left over from the burning of other objects. The place was quiet and calm, although groups of men in cars pulled up and kept an eye on us as we wandered around. 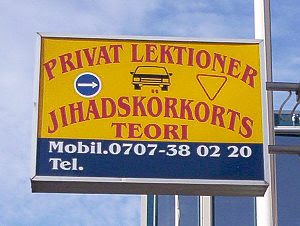 To be completely accurate, the “Jihad” in “Jihadskörkorts” is the genitive (possessive) case, and presumably refers to the name of the proprietor. That is, it says “Jihad’s Driving School”. 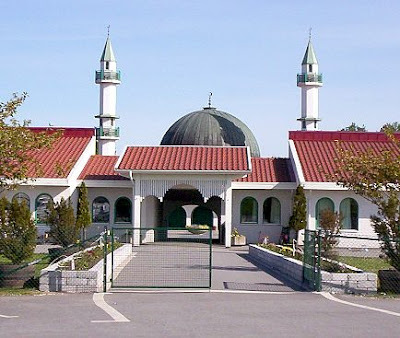 The mosque is far away from the Muslim housing estates in Rosengård. According to our Swedish guide, most of Rosengård’s Muslims worship at the “basement mosques”, and not the fancy one with the minarets paid for by Saudi money. But there it stands, anyway: an assertion of political supremacy, claiming for the Ummah with its dome and minarets the sacred territory of Rosengård. Our guide led us on a tour of the old town and the University, and we finished up by having a very haram dinner at an old restaurant just south of the Cathedral. 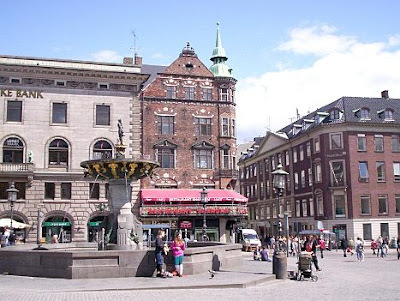 It was quite late by the time our group straggled back to the railway station in Malmö and took the return train to Copenhagen, where the hardiest among us gathered in the bar at the hotel for a nightcap. We’ve come a long way in just a little over two years. 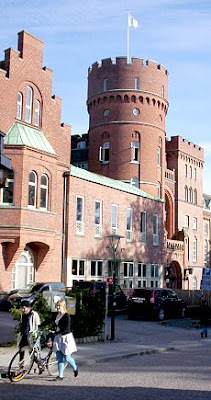 The first Counterjihad Summit was held in Copenhagen back in April 2007, and the European and North American networks have been developing continuously since then. CVF — which has recently been folded into the larger and more comprehensive International Civil Liberties Alliance — followed up with Counterjihad Brussels 2007 and Counterjihad Vienna 2008. 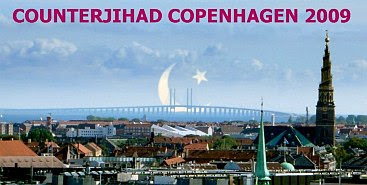 Last weekend a group of like-minded people convened in Copenhagen for Counterjihad 2009. Unlike some of our previous efforts, this was a working meeting, and did not feature a slate of prominent speakers in a conference format. It was designed to strengthen, extend, and deepen the existing networks of anti-jihad activists and bloggers. The meeting was held on Saturday May 16 and Sunday May 17. The sessions on each day were organized as roundtable discussions in a workshop format. Each session had one or two presenters, but the entire process was interactive throughout, with several ICLA leaders acting as moderators of the discussions. Day One focused mainly on the network, and was more about process than content. Presenters discussed various aspects of organizing and maintaining Counterjihad networks in Europe and North America, and how different groups interact and respond in their respective societies. Given the nature of our work, these networks must often be unobtrusive and non-public. Depending on the countries involved, our activities may be subject to harassment from government authorities, quasi-governmental entities such as Antifa, and Muslims. Several sessions dealt with the practicalities of recruiting, operating, and expanding under these circumstances, paying special attention to security issues. Day Two concentrated on action, which is the end result of all our networking and organizational efforts. Topics included demonstrations, public-awareness actions, legislative initiatives, letter-writing campaigns, and a “housewife’s kit” for ordinary citizens interested in the Counterjihad. A brief summary of the two days’ sessions is below. More detailed material will be presented in later posts. I opened the proceedings with an introduction to “The Distributed Counterjihad Network”. In the next day or two I’ll post a report adapted from my remarks and the discussion that accompanied it. The second session was “Among Criminal Muslims”, a report by a Danish psychologist who has extensive personal experience dealing with the most criminal youngsters in Denmark. The majority of these are Muslims, and this has important implications for dealing with problems of integration. He gave an account of his experience, describing how the existing prison system tends to encourage and harden extremism. The discussion focused on the way “natives” are forced to interact with a Muslim population that includes a high proportion of violent criminals. In the afternoon one of the leaders of ICLA gave an excellent presentation on the current crisis of the EU, especially the financial crisis, and how it will affect the growing resistance to immigration and the Islamization of Europe. ESW gave a report and slideshow on current conditions in Kosovo, with Serge Trifkovic providing background information and historical details. The first session on the second day was chaired by Serge Trifkovic, who brought his extensive knowledge and experience to bear in a discussion about the “Green Corridor” in the Balkans. Kosovo is just one piece of the mosaic that makes up the corridor, which has created a collection of contiguous Muslim entities running all the way from the European portion of Turkey to northwestern Bosnia. The misguided role of the United States — which seeks to ingratiate itself with Islamic countries by doing good deeds for Muslims — is one of the main issues to consider when analyzing political affairs in the Balkans. The topic was part of a wider discussion on “Jihadist Geopolitical Designs”. Legislative initiatives are perhaps the most important field of action. Designing, writing, and proposing laws — even if they fail to pass — focuses the spotlight on sharia and the dangers of Islamization, building public awareness of the problem. Well-informed members of the network become lobbyists against sharia, establishing working relationships with receptive politicians at the local and national level. Our Austrian correspondent ESW headed two sessions. The first concerned the legendary fifteen demands of the Akademikerbund Manifesto, which was reported in this space last year. The Austrian Counterjihad faces problems regarding the introduction of legislation, and ESW summarized what is being done to work around the problems. ESW’s second session concerned “Counterjihad for beginners”. As we encounter people who take an interest in resisting Islamization, and basically agree with us, the pertinent question frequently is: “What can I do about it?”. ESW introduced a “housewife’s kit” that lists a wide variety of useful things that can be done easily, on the cheap, and with minimal or absolutely no personal risk. During the rest of the afternoon several presenters covered various action-related topics, including engaging our opponents in the war of ideas, and the necessity for controversial and provocative tactics. The last several hours were taken up with a general discussion and an exchange of useful practical suggestions. After the sessions on Saturday and Sunday, a number of the participants adjourned to Steen’s salon to continue our discussions over food and adult beverages. In many ways, this is my favorite part of such meetings: a small gathering in an informal setting where a free range of opinions flows. Some of our best ideas are hatched under these circumstances. As I sat there listening to the flow of conversation around me, I heard French, German, Romanian, Swedish, Danish, and English being spoken. The Scandinavians conversed among themselves in one or more variants of their own languages, with word changes thrown in to account for differences in vocabulary between Swedish and Danish. But when the conversation encompassed a larger group, English — thank God! — was the common tongue. This, I thought, is the real Multiculturalism at work. This was a group of like-minded European volunteers gathering for a common purpose. Some of the most brilliant minds of the Western world were present in Steen’s flat on those two nights. If the world were organized rationally, these people would hold political office or be helping to form public policy in their respective countries. But, as it is, they have to use pseudonyms, hide their activities, and fly under the radar to avoid persecution for mounting a resistance to the destruction of their countries and their cultures. Such is the sad level to which Western Civilization has sunk. Given my imminent unemployment and reduced circumstances, Counterjihad Copenhagen 2009 will likely be my last such event for the foreseeable future. But we’ve come a long way in two years, and the Counterjihad network will function perfectly well in my absence. Our initial goals have been met: we have formed a well-functioning decentralized network that connects different organizations and individuals together as they work towards a common goal. Information travels quickly and efficiently within this network and its associated organizations, providing an opportunity to plan and coordinate actions in different countries. Translations of relevant material into all major European languages is routine, and ensures that local groups do not remain isolated and atomized. People know the obstacles and risks that they face when they volunteer for the Counterjihad. They are automatically stigmatized as “racists”, “xenophobes”, “neo-Nazis”, and “Islamophobes”. They risk losing their jobs and their livelihoods, and in some countries they can be prosecuted for their opinions under the laws against racial discrimination. Yet still they join the resistance. This is a visible sign of the depth of feeling among ordinary people about the deliberate destruction of European culture by the transnational elites. And even now things are changing: all across Europe the right-wing “xenophobic” parties are rising in the polls and gaining seats in local and national elections. Next month’s European parliamentary election will likely result in the entry of Sverigedemokraterna and Libertas into the EP, as well as more seats for Vlaams Belang, the PVV, Dansk Volkeparti, and other nationalist parties. Some analysts make the mistake of relying on linear extrapolation to predict the future, but historical processes do not follow linear patterns. Affairs tend to proceed smoothly enough for a time, but all the while tension, resentment, and rage are building. Then comes a relatively small event — Gavrilo Princip pulling the trigger, for example — and the world is irrevocably changed. We’re heading into one of those discontinuities right now, and sooner than most people think. Wie der Islam funktioniert. Der Islam – ein komplettes System. Der Islam – ein komplettes System. eine « Schweizerzeit » – Dokumentation.